Nasal polyps appear as grape-like structures in the upper nasal cavity, originating from within the ostiomeatal complex. They consist of loose connective tissue, oedema, inflammatory cells as well as some glands and capillaries, and are covered with varying types of epithelium, mostly respiratory pseudostratified epithelium with ciliated and goblet cells. The reason why polyps develop in some patients and not in others remains unknown. There is a definite relationship in patients with: asthma, non-steroidal anti-inflammatory drugs (NSAID) sensitivity and nasal polyps. However, not all patients with NSAID sensitivity have nasal polyps, and vice-versa. The prevalence of NP has been found to be 4.2%, with a higher prevalence (6.7%) in asthmatic patients. In general, NP occurs in all races and becomes more common with age. The average age of onset is approximately 42 years, which is 7 years older than the average age of the onset of asthma. NP are uncommon under the age of 20 and are more frequently found in men than in women. Large NP can be visualized by anterior rhinoscopy, whereas nasal endoscopy is warranted for the diagnosis of smaller NP. Nasal endoscopy appears to be a prerequisite for an accurate estimate of the prevalence of NP, as not all patients that claim to have NP actually have polyps on nasal endoscopy (1). Polyps that become symptomatic may remain undiagnosed, either because they are missed during anterior rhinoscopy and/or because patients do not see their doctor for this problem. Indeed, one third of patients with CRS with NP do not seek medical advice for their sinonasal symptoms (2). Compared to patients with CRS with NP not seeking medical attention, those actively seeking medical care for CRS with NP had more extensive NP with more reduction of peak nasal inspiratory flow and greater impairment of the sense of smell (3). It is of value to look separately at the effect on rhinitis symptoms associated with polyposis and the effect on the size of nasal polyps per se. Traditionally systemic steroids have been used in CRS patients with NP although no placebo-controlled studies or dose-effect studies have supported the concept. Studies on systemic steroids in NP have recently been published giving support to the clinical impression that they are effective after two weeks use in doses acceptable for a majority of patients. As well as symptom relief, an effect on polyp size and MRI (Magnetic Resonance Imaging) changes are observed. The Anti-inflammatory effects of corticosteroids cannot be separated from their metabolic effects, as all cells use the same glucocorticoid receptor; therefore when corticosteroids are prescribed measures should be taken to minimize their side effects. Clearly, the chance of significant side effects increases with the dose and duration of treatment and so the minimum dose necessary to control the disease should be given. The safety of nasal and oral corticosteroids has been the subject of concern in medical literature since many patients with chronic sinus disease are prescribed these drugs due to their efficacy. Suppression of the hypothalamic-pituitary-adrenal axis, osteoporosis or changes in bone mineral density, growth retardation in children, cataracts and glaucoma have been reported to be the main adverse effects of corticosteroid treatment (6). In relation to adverse effects of corticosteroids, it is obvious that a clear distinction needs to be made between nasal (topical) and oral corticosteroids. There is insufficient evidence from the literature to relate the use of nasal corticosteroids at licensed doses to changes in bone mineral biology, cataract and glaucoma. Adrenal suppression may occur with some nasal corticosteroids at licensed doses, but the clinical relevance remains uncertain. Overuse of nasal corticosteroids may be responsible for adrenal insufficiency and decrease in bone mineral density. Of note, inhaled corticosteroids are the mainstay of treatment for children and adults with asthma and are more often associated with systemic side effects than the nasal route of treatment for rhinosinusitis. Intranasal administration of corticosteroids is associated with minor nose bleeding in a small proportion of recipients. This effect has been attributed to the vasoconstrictor activity of the corticosteroid molecules, and is considered to account for the very rare occurrence of nasal septal perforation (5) although it is also hypothesized that it could be related to repeated traumas on the nasal mucosa and septal cartilage by the nasal device, to the underlying nasal disorder for which corticosteroids were prescribed. However, it should be remembered that minor nosebleeds are common in the population. Nasal biopsy studies do not show any detrimental structural effects within the nasal mucosa with long-term administration of intranasal corticosteroids (6). Short treatment with oral corticosteroids is effective in chronic rhinosinusitis with nasal polyps. It is obvious that repeated or prolonged use of oral corticosteroids is associated with a significantly enhanced risk of the above-mentioned side effects. In summary, intranasal corticosteroids are highly effective in cases of NP; nevertheless, they are not completely devoid of systemic effects. Thus, care has to be taken, especially in children, when long-term treatments are prescribed. 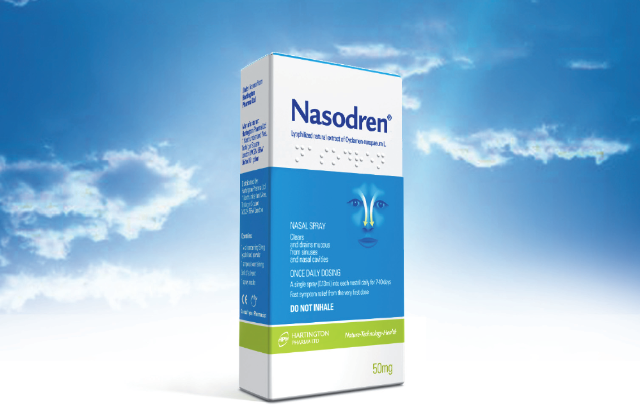 Nasodren can be used both in monotherapy and in combination with other products used to treat rhinosinusitis, including, obviously, corticoids. It has been proven that the addition of Nasodren to any rhinosinusitis treatment or a combination of treatments increases the cure rate by 19% (7). In cases where the patient has huge polyps, these can obstruct the ostiomeatal complexes, preventing mucus drainage from sinuses. This is perceived as a lack of efficacy of Nasodrenâ. Since corticoids reduce polyp size, the concomitant use of Nasodrenâ and corticoids may cause symptom relief. Johansson L, Akerlund A, Holmberg K, Melen I, Bende M. Prevalence of nasal polyps in adults: the Skovde population based study. Ann Otol Rhinol Laryngol. 2003; 112(7): 625-9. Klossek JM, Neukirch F, Pribil C, Jankowski R, Serrano E, Chanal I, et al. Prevalence of nasal polyposis in France: A cross sectional, case-control study. Allergy. 2005; 60(2): 233-7. Cave A, Arlett P, Lee E. Inhaled and nasal corticosteroids: factors affecting the risks of systemic adverse effects. Pharmacol Ther. 1999 Sep; 83(3):153-79. Salib RJ, Howarth PH. Safety and tolerability profiles of intranasal antihistamines and intranasal corticosteroids in the treatment of allergic rhinitis. Drug Saf. 2003; 26(12):863-93. Holm AF, Fokkens WJ, Godthelp T, Mulder PG, Vroom TM, Rijntjes E. A 1-year placebo-controlled study of intranasal fluticasone propionate aqueous nasal spray in patients with perennial allergic rhinitis: a safety and biopsy study. Clin Otolaryngol.1998; 23(1):69-73. Mullol J. Is it possible to cure all forms of acute rhinosinusitis in 4 weeks? Evidence from the PROSINUS study. ERS 2008.